'Beasts' is a catch-all term for everything else that seems to be within the remit of BIGG, but which doesn't seem to fit the other categories. If that sounds boring they you've been misled. Beasts are various, often strange or weird, but always wonderful. Beasts may be hobby horses, dragons, fish, birds ... The list is as endless as imagination. We've seen animated rocks and whirling gnomes. In the British Isles many beasts are associated with teams of morris dancers, we leave the Morris Ring to keep track of them. We try to represent some of the rest. 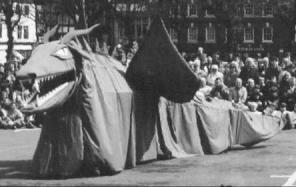 Here is an example of a very large beast, the Salisbury Dragon, who appears every St. George's Day at the 'Riding the George' pageant. The dragon is not very typical as it's on wheels which prevent it indulging in any very vigorous antics.